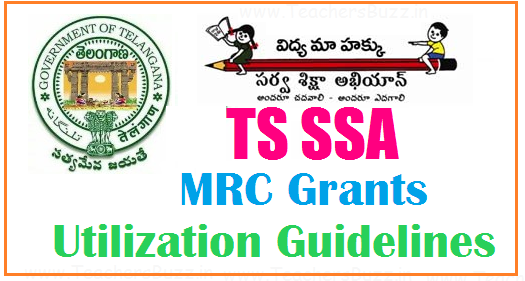 TS SSA MRC Grants Utilization Guidelines,Norms 2018-19, Telangana SSA MRC Grants Utilization Guidelines 2018, TS SSA MRC Grants, Instructions for Utilization Grants, General Guidelines, MRC Grant Utilization Guidelines, Contingency Grant, Meetings and TA Grant, Norms for Utilization of Mandal Resource Center Grants. Sarva Shiksha Abhiyan, Telangana, Hyderabad has given Guidelines on the utilization of MRC Grants . The following guidelines are issued for utilization of various grants that is Mandal Resource Center Grants to be released under Sarva Shiksha Abhiyan during 2018-19. Contingent Grant, TA, TLM and meetings,FTA to MEOs,Stationery, Xerox, office maintenance, postage charges allotments details are given here.